SINGAPORE (Jan 25): Rising interest rates and the latest round of property curbs have put the brakes on mortgage demand at Singapore’s banks, potentially further dragging down the city’s housing market. Home-loan growth slowed to 1.9% in the first 11 months of 2018, less than half the 4.2% increase posted in 2017, the latest Monetary Authority of Singapore data show. Mortgage growth will stay stuck below 2% this year, according to Diksha Gera, an analyst at Bloomberg Intelligence. The credit slowdown threatens to further accelerate the decline in residential prices, which fell for the first time in six quarters in the final three months of last year. Housing values may drop as much as 3% this year, and new home sales might plunge 20%, according to Derek Tan, a real estate analyst at DBS Group Holdings Ltd.
A surge in housing supply, rising mortgage rates, a China-led economic slowdown and volatile financial markets are all weighing on sentiment, said Royston Foo, an independent property analyst who publishes on Smartkarma. The latest property curbs announced in July hit mortgage demand, DBS Chief Executive Officer Piyush Gupta said earlier this month. The bank’s Singapore mortgage book grew less than $2.5 billion in 2018, compared to the $4 billion initially anticipated at the start of the year, he said. 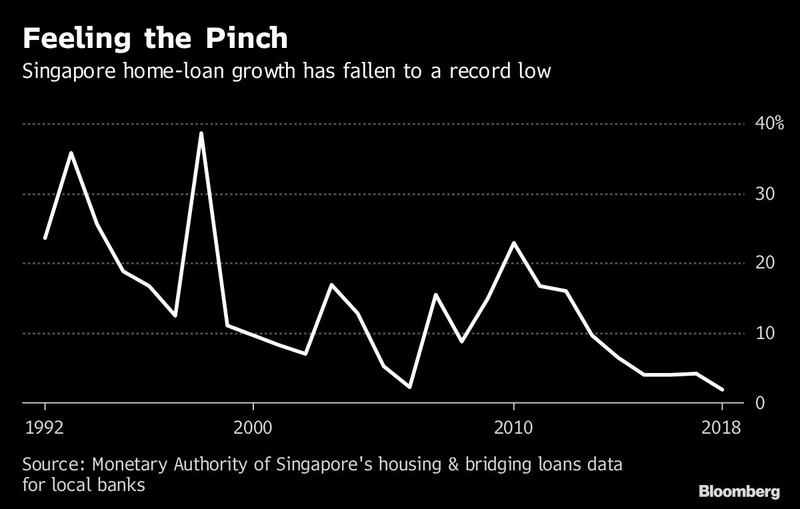 Still, the drop in lending growth won’t necessarily dent earnings at Singapore’s three biggest banks, because recent increases in mortgage rates will buffer interest income. DBS, Oversea-Chinese Banking Corp. and United Overseas Bank Ltd. have raised home loan rates an average 20 basis points in the past three months to just above 2%, and they may climb to 3%, according to Nomura Holdings Inc. analyst Marcus Chua.